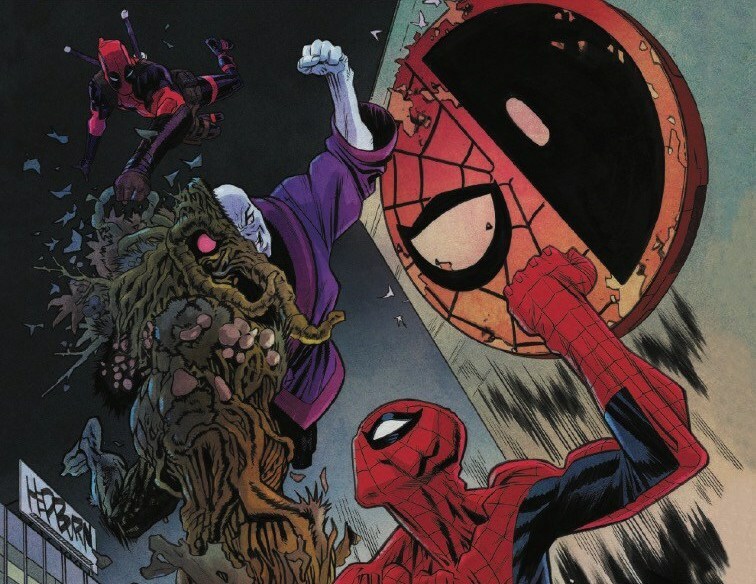 Spider-Man/Deadpool #28 Review – AiPT! Spider-Man and Deadpool tell it like it is. Which makes for two very different recounts. Spider-Man and Deadpool have always had a love it or hate it relationship. They’re cracking wise one minute or Deadpool is trying to kill Spidey the next. That makes today’s issue particularly entertaining as it reveals how they view each other in a given adventure. It’s a he-said-he-said flashback issue baby! This issue is about the love, baby. In particular Deadpool’s love/friendship perspective on Spidey. It’s also about how each character recalls adventures in a slightly different way, which not only adds some humor, but some perspective. Tell it like it is Spidey. Robbie Thompson writes quite an issue here which doesn’t feel like it retreads anything even though it retells the same action scene from both perspectives. This is in part because the art is split up between Chris Bachalo and Matt Horak leaving Bachalo to the telling portions and Horak to the flashback portions. As Spidey tells Diamondback what happened Thompson teases out little things Spider-Man made up or embellishes, which are fun wrinkles. After the story shows us his perspective we get to see Deadpool relay what happened to his team (flying high on the USS Pool S.H.I.E.L.D carrier) and it generates another sense of humor entirely. By the end of the issue readers, and Deadpool for that matter, determine something is up with Chameleon by piecing details together. That adds an additional purpose to the retelling of the action scene. It also helps that Horak’s art in these action scenes keeps the action intense with good layouts and scene progression. The gore is quite cool (we get to see through Deadpool’s chest!) and much props to the webbing in each shot. Bachalo meanwhile keeps his scenes slow and concentrated which works with the storytelling style of the scenes. Deadpool and Spider-Man are going over what happened and it’s very serious business. One could argue not a lot actually happens in the issue. Aside from the single action scene told twice we do get some major progress on Chameleon’s plans. The entire narrative structure is so fun however you’ll hardly notice. A good Spidey/Deadpool caper if I ever saw one. If you ever wanted to hear a story told twice from very different perspectives, this is the story to read. Spider-Man and Deadpool are such zany and fun characters, of course, they put an everloving, fun spin on things. A fun story that mixes things up with two perspectives both of which are kinda crazy.